Combine balsamic vinegar, cider vinegar, corn oil, and ketchup in a bowl. Add skirt steaks and marinate for two hours. Remove steaks, blot excess marinade with a paper towel, and rub both sides with barbecue spice rub. Preheat oven to 375 degrees. Heat 12-inch cast-iron skillet over moderately high heat until just smoking. Generously film bottom with corn oil to prevent spices from burning. Cut steaks in half so they fit in the pan. Working two pieces at a time, sear steaks for three minutes on each side, transferring to sheet pan when each batch is done. Place pan in oven and cook until internal temperature is 115 to 125, approximately six minutes. Remove from oven and let rest three or four minutes before slicing. Serve topped with charred onions and jalapeños. Lay vegetables on sheet pan, coat with corn oil, and season with salt and pepper. Heat a 12-inch cast-iron skillet over moderately high heat until just smoking. Working in small batches, char vegetables on all sides. (Alternatively, vegetables can be charred on a grill.) Return all vegetables to pan, then add butter, stock, and thyme and cook uncovered over medium heat until vegetables are fork-tender and broth is reduced to a thickened sauce, about 20 minutes. 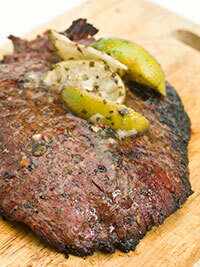 This entry was posted in Recipes and tagged aduentus, BBQ, food pairing, malbec, mendoza, recipe, wine, wine pairing. Bookmark the permalink.